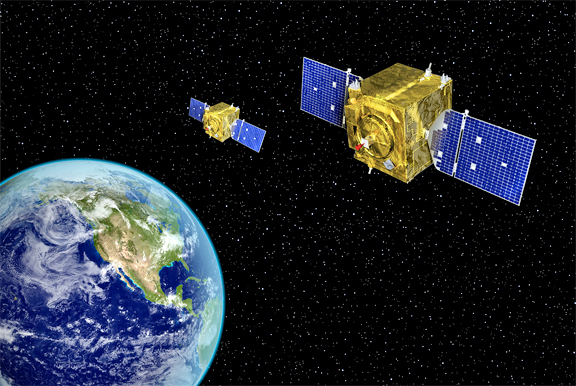 The First Two Geosynchronous Space Situational Awareness Program (GSSAP) Are Declared Operational By U.S.A.F. [Satnews] General John E. Hyten, commander of Air Force Space Command (AFSPC), declared Initial Operational Capability (IOC) for the first two Geosynchronous Space Situational Awareness Program (GSSAP) spacecraft on September 29, 2015. This significant achievement is reflective of the outstanding collaboration between numerous organizations, including AFSPC, U.S. Strategic Command (USSTRATCOM) and its Joint Functional Component Command for Space (JFCC Space), the Space and Missile Systems Center, 14th Air Force, the 50th Space Wing (50th SW) and Orbital ATK Corporation. This is the latest in a series of efforts by the defense and intelligence communities to strengthen Space Situational Awareness (SSA), including establishing a new Joint Interagency Combined Space Operations Center, agreeing to continue working together to increase space collaboration and coordination, and taking other steps to increase resilience. The declaration of IOC for GSSAP concludes successful testing of the system and brings on line an SSA capability that will improve our ability to rapidly detect, warn, characterize and attribute disturbances to space systems in the geosynchronous (GEO) environment. The system reduces the likelihood of space collision, increases safety in this domain and will support USSTRATCOM’s Unified Command Plan-assigned mission to plan and conduct SSA. GSSAP’s maneuverability and vantage point near GEO make it a valuable addition to existing U.S. operational assets. Other assets conducting SSA of GEO, which GSSAP complements, include the Space Based Space Surveillance system, which operates in LEO, and multiple ground-based sensors. The Space and Missile Systems Center, located at Los Angeles Air Force Base, operated the satellites during nearly a year of developmental testing. At the conclusion of testing, the Space and Missile Systems Center turned operational control of the satellites over to 14th Air Force, which was delegated to the 1st Space Operations Squadron, 50th SW, for operational test and evaluation. "We're extremely honored to declare IOC for the Geosynchronous Space Situational Awareness Program," said Lt. Col. Casey Beard, 1 SOPS Commander. "We look forward to integrating this new system and capability into our space-based space situational awareness architecture and enhancing space situational awareness."